Wedding held at the Children’s Museum. Are you newly engaged in the Burgh? Looking for a place to have your wedding that isn’t the usual bland hotel ballroom? Here are fifteen options all in the Pittsburgh area that are available to rent for the wedding of your dreams. 1000 Indiana Road Verona, PA info@springwood.org 412-793-7453 About: Sixty acres of wooded Pennsylvania hills, walking trails and wildflower meadows with a glass atrium, gazebo, and walking trails. 693 Donegal Lake Road Stahlstown, PA info@oaklodgepa.com 724-593-2913 About: Have an entire three-day wedding weekend at the Oak Lodge. There’s indoor seating at the chapel for up to 120 guests, tables and chairs provided for 150 people, and tiki torches. Main Lodge accommodations for bridal party up to 15 and a luxurious bridal suite with a Jacuzzi, fireplace, views, and a waterfall. 5516 Maple Heights Road Pittsburgh, PA nicole@mansionmapleheights.com 412-427-2877 About: The Mansion can accommodate up to 150 guests and the package price includes: rental of entire mansion, outdoor tent, chairs, tables, plates, silverware, glasses, valet parking and security, and a wedding planner. 3030 Jane Street Pittsburgh, PA jvsevents@earthlink.net 412-381-5350 About: Open studio space that you can completely personalize according to your own taste availble to rent in the South Side. 188 Forks Church Road Leechburg, PA info@lingrowfarm.com 724-472-1305 About: A two-story, fully renovated, 1850’s barn, complete with two oversized, covered decks, situated on 40 peaceful acres. The barn is heated and air-conditioned and if you book an April wedding, you will receive 30% off venue cost. 2119 Sarah Street Pittsburgh, PA (412) 431-1707 About: This South Side bed and breakfast is a unique place to hold your wedding for an indoor/outdoor reception with a candlelit garden courtyard. 339 Penn Avenue Pittsburgh, PA info@enginehouse25.com 412-621-1268 About: Fees depend upon how long and how many people are invited, and the capacity for a sit-down dinner is 75. Rental fee includes event staff and planning, tables, chairs, and linens. Wine services are available. 1212 Smallman Street Pittsburgh, PA mlminteer@heinzhistory.org 412-454-6435 About: Have you wedding at the historic Heinz History Center for an unforgettable Pittsburgh wedding. Common Plea Catering is the exclusive food and beverage service that also supplies linens. 160 Scharberry Lane Mars, PA info@twelveoaksmansion.com 724-625-2343 About: Five hour reception includes: a private bridal suite, ballroom with outdoor patio, table linens and napkins. In wedding months (May to October), Twelve Oaks has a minimum expense balance of $12K. 1491 Mill Run Road Mill Run, PA kandyjohn@paconserve.org 724-329-7802 About: With four different spaces to choose from, The Barn at Falling Water will make for an unforgettable wedding. 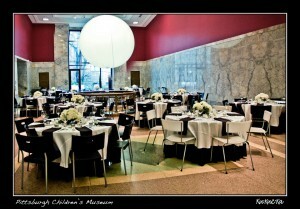 10 Children’s Way, Allegheny Square Pittsburgh, PA events@pittsburghkids.org (412) 322-5058, ext. 235 About: Rent the studio that includes the backyard, the Big Red Room, or the entire museum for four hours with the help of their staff who will help you create the wedding day of your dreams. 6 Allegheny Square East Pittsburgh, PA 412-320-4610 About: Limitless design options are available at the New Hazlett Theater. There’s no required caterer complete custom bar service and event planning options, professional event staffing and it is a totally unique space to throw your wedding. 7227 Reynolds Street Pittsburgh, PA sehler@TheFrickPIttsburgh.org 412-371-0600, ext. 658 About: The Frick has to be one of the most beautiful places to hold a wedding in Pittsburgh. From an outdoor ceremony with a tent on the lawns, to Clayton, the Art Museum, and the Greenhouse, The Frick is sure to be an unforgettable wedding destination. 123 University Place Pittsburgh, PA uclub@pitt.edu 412-648-8213 About: Complimentary wedding night accommodations for the bride and groom, linens and napkins, candlelit mirror centerpieces, personalized service from their event planner.